Samantha Smythe has her hands full with three active young sons and an absent husband who’s drinking champagne for breakfast in London. And she’s tying herself in knots trying for a longed-for baby girl … And then out of the blue Samantha’s old friend Naomi turns up and deposits her daughter with her. 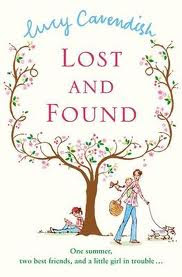 Lost and Found is the sequel to Samantha Smythe's Modern Family Journal and is a tug-at-your-heart-strings but still laugh-out-loud hilariously funny novel that I would recommend to anyone who has kids or thinks they might want them in the future or even can appreciate that motherhood is a bit of a crazy ride sometimes. Cavendish has a wonderful writing style and her Samantha Smythe series comes across as a natural and honest account of one mother’s thoughts. This novel focuses less on the day to day and more on a segment of the family’s lives when Samantha is trying to come to terms with wanting a daughter (maybe!) and then ending up with an old friend’s daughter being left to live with her temporarily. I think this relationship with little Lexie and her realisation that her old friend Naomi is not what she wants her to be, really helped to grow Samantha’s character for the reader. I absolutely love the children in these novels- I read in the back of the book that it was important to Cavendish that the children and the husband were real people and she certainly accomplished that. They are the best! There’s nothing about this sequel that I didn’t like- one of the funniest things about the first novel are the lists throughout the story of the things her kids won’t eat/will eat, won’t wear/will wear etc. This book doesn’t have the same lists but there are asides of Samantha’s own thoughts which are just as funny. Although I’m not exactly like Samantha (I’m definitely not as patient for a start) I’d like to think that she’s inspired me to be a bit more relaxed about what my kids eat in a week as well as a few other things... I have to admit that I feel a little bit attached to Samantha and I have had to persuade myself that she’s not really someone I can pick up the phone and talk to- it’s always a bit disappointing actually to realise she isn’t real. I think I’m going to have a hard time leaving a gap between this book and the last in the series (which is sitting on my shelf calling to me already)!